From infants to elderly persons, convalescents to persons with special needs, Canadian Caregivers Placement Service offers exceptional employer-employee matching services. Canadian Caregivers(TM) is a full-service family placement agency for domestic and foreign nannies and caregivers. If you are an experienced and trained nanny, elderly, or special care provider looking for a great family to work with in Canada, you've come to the right place! 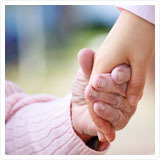 Are you a busy family looking for an experienced nanny or caregiver to care for your loved ones? Our full-service placement agency can help you find the higest quailified nannies and caregivers for your family.